Pura Vida (Pure Life) is more than just a national slogan. Pura vida is not just a statement. It’s more than a salutation or a response. It’s even more than a feeling (no Boston pun intended) or a state of being. It’s a way of life. It’s a philosophy. Get that Pura Vida feeling! Check out some of the best Jaco Tours here! Costa Rica is Pura Vida! 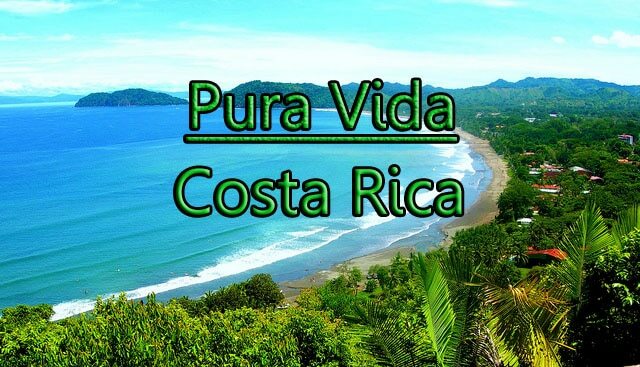 Pura Vida is a big part of why Costa Rica scored #1 out of 151 countries on the Happy Planet Index. Mostly drue to long life expectancy and awesome state of well-being, the British think-tank declared Costa Rica the happiest country on the planet! It must be that care-free mind-set that encompasses ‘Pura Vida’! The index is based on “sustainable well-being”. They measure the quality of life, average life span, and a peoples’ ecological footprint. Costa Rica has topped this list for consecutive years now and still remains king of the happiness hill. Costa Rica is so pura vida that they completely abolished its army in 1949. So, Costa Rica vacations are the way to go if you want to find a peaceful place to relax with care-free and loving people! Don’t Stress … Pura Vida! Why would you want to go on vacation to some place where the people are stressed out and anxious … passing their dark cloud onto all who they come into contact with? When your in Costa Rica, its constant hakuna matata! Oops … I mean, pura vida! It means no worries for the rest of your days! Come to the place where we live and embody a problem free philosophy (thanks, Timon and Pumba)! Are you planning a trip to Costa Rica? Check out some of the most affordable luxury Jaco, Costa Rica Vacation Rentals right here.